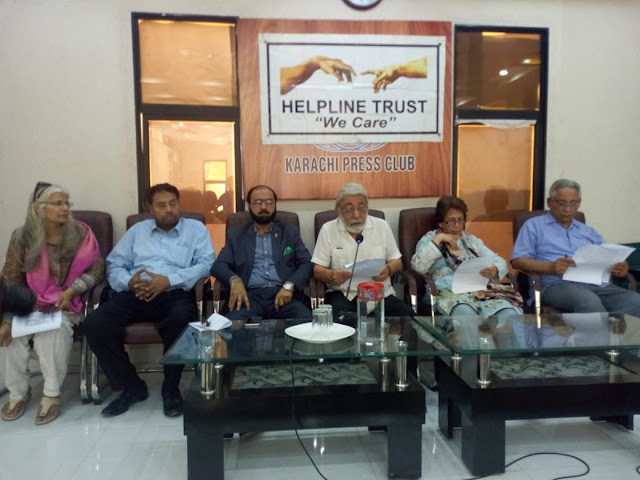 KARACHI April 10: Helpline Trust organized a press conference to urge the Government of Sindh to fast track the delivery of its promise of setting up Consumer Councils. Explaining the purpose, Trustee Afia Salam told the journalists that the Sindh Advisor on Law, Barrister Murtaza Wahab had announced at the Helpline seminar that the Government will take steps to make the public aware about the law, and will also make amendments if they are needed once the feedback about the law in practise is received. This is why members of the other consumer rights bodies, Shakeel Ahmed Baig of Consumer Rights Protection Council of Pakistan and Umer Ghouri of Consumer Voice had been invited to be a part of the joint call of action. Founder Chairman A. Hamid Maker that the law was passed after a long struggle and even after the gap between its passage and operationalizing is of over four years. He said for the consumers to derive its real benefits, the Government must undertake a massive promotional campaign and translate and explain the law and procedure through an easy to understand guide in Urdu and Sindhi. Trustee Justice Retired Majida Razvi, who is also the Chair of the Sindh Commission for Human Rights explained that Councils are supposed to gather data about consumer issues and also guide the public through awareness campaigns so it is important that credible persons be nominated on those councils immediately. Capt. Farooq Harekar pointed out to the of the proceedings of the first ever case filed by a citizen in District East of Karachi wherein the judge also expressed his dismay at the prerequisites not being in place. Shakeel Baig appraised the audience about the condition of the existing courts set up for Karachi and suggested that to facilitate the consumers, they should be situated in each District Commissioner's office instead of the City Courts. Omar Ghauri also said that the Government must take up this offer of assistance to spread the word and also work on a more consumer friendly mode of complaint lodging either through a mobile app or a web portal, and then spread the message far and wide. The speakers urged the media to become an ally and take the message to the government so that the rampant ills of sub-standard, counterfeit and fake products and services, especially on online platforms can be dealt with.